Mr Azhar Iqbal’s training started in 1993 after his post graduation, ie FRCS, minimum entry criteria for plastic surgery training. After 12 years of training at different levels, he became a consultant in the NHS in 2005 (a seal of approval of completion of training to the highest level). Mr Azhar Iqbal does most of the reconstructive and aesthetic range including breast reconstruction, skin cancers, facial palsy, hand surgery and all aspects of cosmetic/reconstructive surgery, including breast and body contouring surgery, eyelid surgery, nose reshaping and ear pinning. 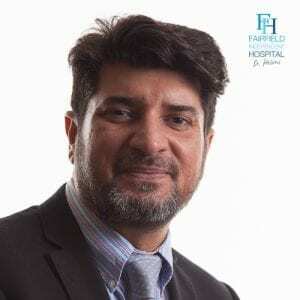 Mr Iqbal has introduced many new techniques in his speciality, including a unique way of breast reconstruction and presented and published extensively in peer reviewed journals.